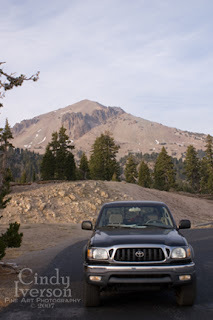 The last day of the road trip that my mom and I took a week ago, we decided to go to our favorite national park--Mount Lassen Volcanic National Park. Lassen is only a 15 minute drive from where we spent the night in Chester. So after a yummy diner breakfast at the Kopper Kettle in Chester (it's been there since 1956), we headed off down the road. We had to pull over briefly when the road crossed Mill Creek in order for me to photograph our favorite meadow (photo above). The elevation climbs rather quickly from Chester (4598 ft elevation) to the entrance of Mt. Lassen Volcanic National Park (about 6000 ft elevation). The terrain changes from forests of deciduous and evergreens in Chester to mainly evergreens with manzanita scrub. In summer, the scenery looks like it came straight out of the movies Sound of Music or Heidi--very alpine, very untouched, very pristine, and very "Swiss" (think Ricola commercial). In recent years, the snow from winter very often doesn't melt off until well into August at the higher points in Lassen where the 35 miles main park road winds up and up to its high point of 8512 feet in elevation. Mom's has a senior pass to the national parks so we were able to get in for free! That was very cool as the regular admission is $10 (it's good for 7 days of entrance). The ranger at the entrance gate gives all visitors informational brochures so one can be fully educated about the park. It's really good reading! "In 1907 President Theodore Roosevelt established Lassen Peak and Cinder Cone National Monument. 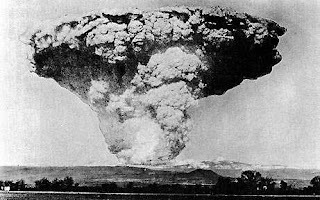 Lassen Peak began a series of eruptions in 1914 that lasted until 1921. 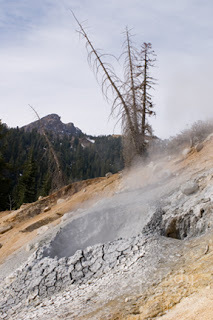 Lassen Volcanic National Park was established on August 9, 1916 to protect the site of what was then the most recent volcanic activity in the lower continental United States. Its related natural and cultural resources are preserved for the benefit and enjoyment of park visitors. 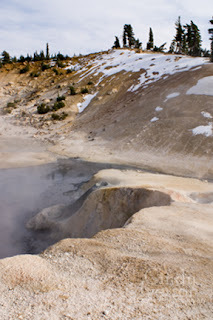 Lassen Volcanic National Park covers 106,00 acres and includes 79,000 acres of designated wilderness." Because of all the volcanic activity still boiling beneath the surface, there are some spectacular sights that we love to see when we visit Lassen. One is right on the side of the main park road, the Sulphur Works. 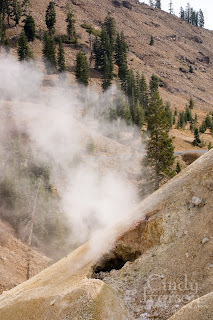 You know you're there because the smell of rotten eggs hangs in the air from the sulphur puffing into the atmosphere. The steam curls up out of holes in the ground and wisps across the roadway, so even if you don't get out you can still smell it. We got out to get a closer look and for me to take photographs. We were surprised to find that a new "pimple" has appeared on the slope right off the road since the last time we were here. It gurgled and glugged loudly from the boiling mud inside. We could see right down by our feet where the mud boiled over after the last rain not too long ago. The sound was so overpowering and the sight of seeing the slick grey mud right at our feet was really eerie. It amazed us how much change is constantly going on. Lassen is never really the same from visit to visit. 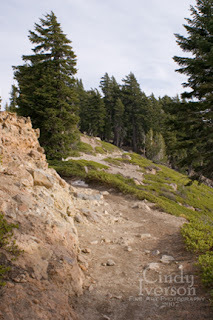 We were feeling adventurous enough to try one of the many hikes throughout Lassen. I wanted really cool photographs. Mom had to be concerned about a leg that she broke just a year ago (and the 9 pins that are holding it together). So we didn't want to do something really difficult. And because of the shorter days of October we were aware of time. So after some consideration, we decided to embark on the 3 mile round trip hike to Bumpass Hell--an area of high geothermal activity. 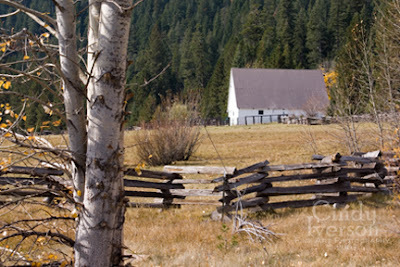 "It is named after Kendall Vanbook Bumpass, a cowboy who worked in the Lassen area in the 1860s. One day Bumpass stumbled upon the area and his leg was badly scalded when it broke though a thin crust above a mud pot. He told his friends and townspeople about it, describing it as 'hell'. A newspaper editor was interested in the story and convinced Bumpass to take him to this place. Unfortunately, Bumpass' leg broke through the crust again - this time it had to be amputated." Poor Bumpass! He should have known with a name like that, he was doomed to something! Anyway... we hiked in on the really cool trail and enjoyed breathtaking scenery that cannot be described in words or adequately captured in photographs. If anyone wants an experience of communing with nature in a "civilized" sort of way, Lassen is the place to do it. I am always amazed at how untouched and pristine it is. It gives me hope that our world isn't as bad off and bleak as it appears to be. I would look out over this endless unspoiled vista that had mountain range after mountain range seemingly layered one upon the other in purples and blues with the sky going on forever, and I would imagine that we were the only people for as far as the eye could see. It wasn't hard to imagine, because there were no other people. That's why Lassen is known as "The One and Lonely". Such a different experience than so many other national parks. I realized that I was getting a chance to see something that only a small fraction of the earth's population would ever see in their lifetime, and I was instantly filled with warmth and gratitude. After almost a mile along a rocky trail often seemingly cut into the side of a mountain slope enjoying endless vistas of greens, blues and purples, we started to get whiffs of that rotten egg smell. We knew we were close! We finally rounded a bend in the trail and saw down below us the scene in this photo. 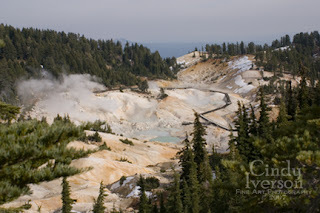 Bumpass Hell! In order to get there, we had to trek down some steep trail that dropped us 200 ft in elevation in only maybe 1/10th of a mile. We sludged through mud, ice and snow and finally got to Bumpass Hell proper. It was an amazing treat and so spectacular--worth the trek in and out. 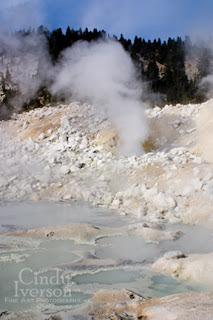 The fumaroles, the boiling mud pots, the steam vents... everything was so spectacular to witness with our own eyes. All too soon it was time to make our way back out again. We had to get out before the sun started setting. 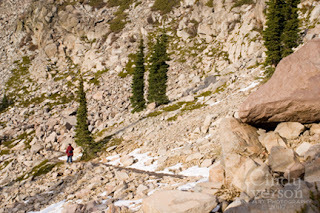 I lagged a little behind on the trail shooting photos and ended up getting a wonderful shot of Mom as she made her way along one rocky part of the trail. The photo here says so much to me. We got back to the truck at the trail head parking lot and took one last look at our beloved Lassen before we had to head home. It's always bittersweet leaving Lassen and the mountain country that we consider to be "home". Although we both agreed that we really don't want to live up there where we would have to tough out some pretty snowy winters, we also feel this pull to go back frequently. 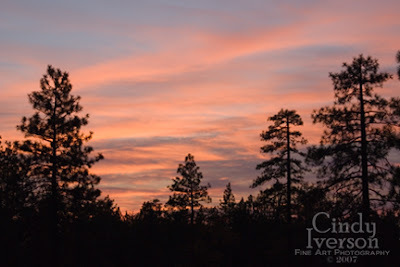 I felt the pull so much that the following weekend, Hubby and I drove back up to Chester so we could hike Lassen's east side into Devil's Kitchen (but that's another entry for another day). For now I'll just end with a photo of the sunset that I took as we were "chasing the sun" to the west, driving home down out of the mountains. It was a spectacular end to a spectacular day. Click here if you'd like to see more photos of our road trip. Nice real valcano pictures,really amazing, pumpkin is so sweet. 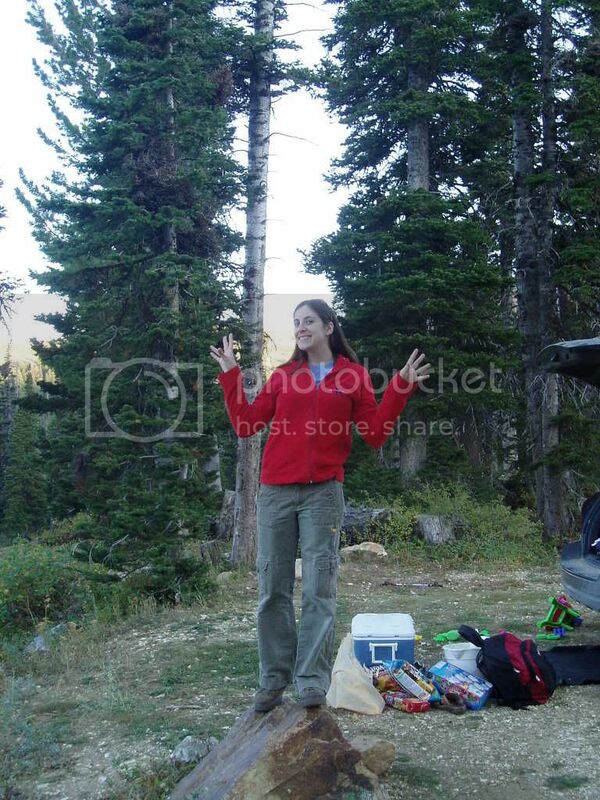 Should I admit that I've never been to Lassen? Gorgeous photos. Glad to see that you're back! We missed you. very interesting, your pictures reminded me of Yellowstone!!! Volcanoes are so cool! What a fabulous place Lassen is! Great photos too, Cindy. I don't know if I'll ever get there, so I appreciate you sharing your trip with us! You have got some excellent photos, Cindy! Sounds like you had a great day and many thanks for sharing it with us! More excellent photos! I especially like the first one. This is such a beatuiful and inspiring account, Cindy! 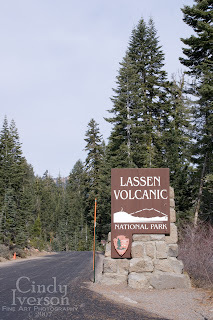 I've never heard of Lassen and now I'm going to tell my husband about it so we can go there one day, if we ever get to that traveling phase of our life, that we aspire to! Sounds like you had a wonderful experience. Your mom is brave to hike at all, with all those pins! Some people would use that as an excuse not to "walk far." Your photos are beautiful. Thanks for the great post!